Getting to the Islands of Tahiti from the United States can be a bit of a complex journey, particularly if you’re from the East Coast since all Tahiti-bound flights depart from the West Coasts. Here we break down how to get to Tahiti from the US. All flights from the US fly into Tahiti’s only international airport, Fa'a'ā International Airport (PPT), which is located on the island of Tahiti. Flights from the US most frequently depart from Los Angeles International Airport (LAX) and at just over 4,100 miles, flight time to PPT is approximately eight hours. Flights also depart from Honolulu International Airport (HNL) and flight time form there to Tahiti is just over four hours. American Airlines, Air Tahiti Nui, Qantas (as a codeshare with Air Tahiti Nui), Air New Zealand (as a codeshare with Air Tahiti Nui), Air France, Alaska Airlines, LAN, Delta, United Airlines, and Hawaiian Airlines all fly from the US to the Tahitian islands. 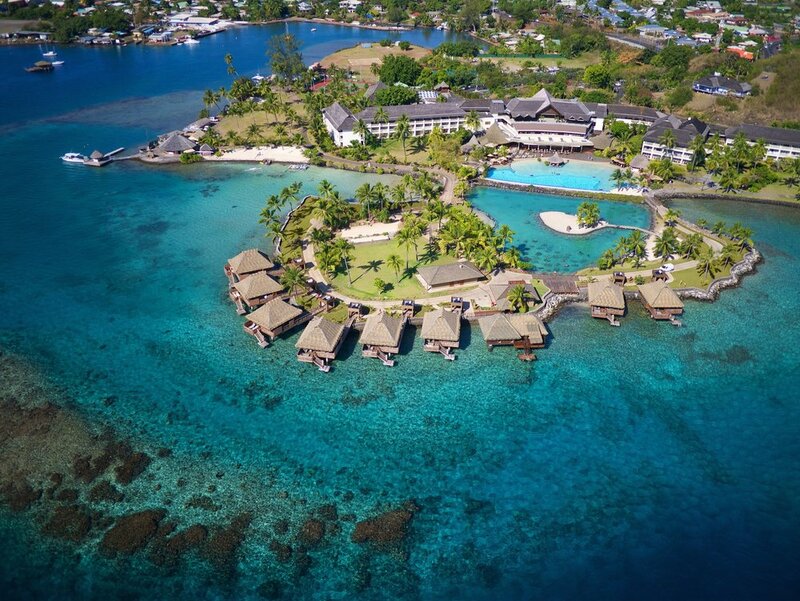 The InterContinental Tahiti is the ideal place to overnight or get a day room during your trip. Air Tahiti Nui is Tahiti’s National carrier and offers the most flights per week from the US to Tahiti with six departures from LAX. If you arrive on the island of Tahiti via Air Tahiti Nui, you’ll have to spend the night on Tahiti before going on to Moorea, Bora Bora, or any of the other Tahitian Islands. This is because international flights in Air Tahiti Nui arrive after the last intraisland domestic flights depart. The upside is that on the day of your departure, you’ll have nearly a full day in Tahiti before the trek home. Not to be confused with Air Tahiti Nui, Air Tahiti is the domestic carrier of Tahiti, offering intraisland flights to Moorea, Bora Bora, Huahine, and more. If you want to visit multiple islands during your trip - which is highly recommended - look into Air Tahiti’s multi-island passes that offer various money-saving options for island hopping. Moorea Airport (MOZ) is also known as Temae Airport or Moorea Temae Airport.